Date completed: 26th July 2017 (with Clare and Joe). Weather conditions: Not a great deal different from yesterday (walk 131). Not actively raining apart from a few minutes’ drizzle, but cloudy on the tops, so no views, and rather windy and chill. Lots of water in the streams and on the ground. 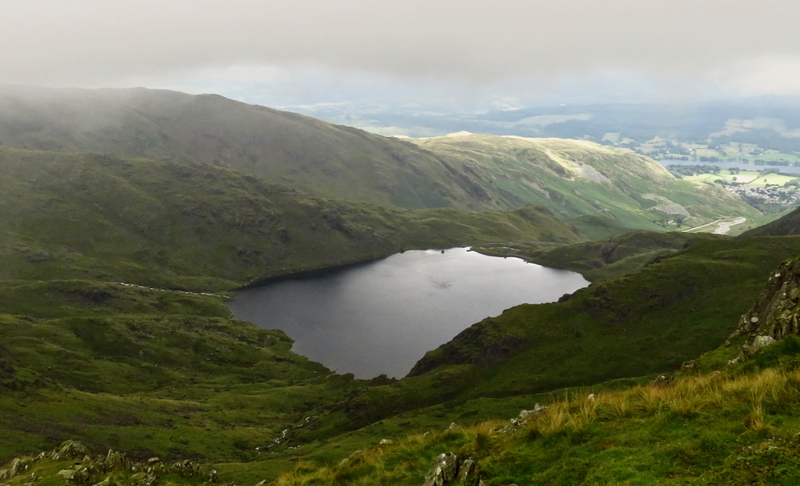 Summits bagged: Coniston Old Man (2633 feet above sea level, number 108 of my second round), Brim Fell (2611’. no. 109). Both were last attained on walk 25 in September 2010. Start and end points: Coniston: specifically the bus stop outside the Crown Inn, where the #505 service from Kendal and Ambleside turns around (as does the #X12 to Ulverston, which still runs two or three times a day). Distance walked: 6.75 miles approximately. Total ascent: 2550 feet approximately. Pub at end: The Black Bull, Coniston. They brew their own beer on the premises (as ‘Coniston Brewery’) and the pint of stout I had was excellent. Though Clare will undoubtedly have a go at me if I fail to mention that neither pub nor brewery broke the unfortunate habit many pubs have at the moment of making their bitters too pale and/or hoppy. 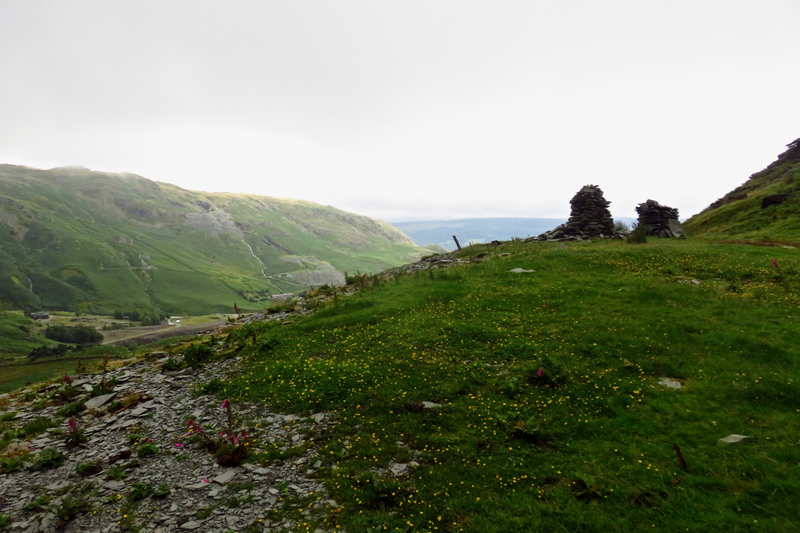 Route: This is a relatively simple route to describe on this page, but it is not necessarily a simple walk to follow despite the popularity of the ascent of the Old Man. That is a long, steep climb, and the descent from Levers Hause isn’t an easy one either. On a clear day, however, all will be compensated for by the views. (Alas we saw none of that today.) Coppermines Valley and the various mines, quarries and waterworks operations therein are interesting, but there will be those who will think these kinds of industries have damaged this landscape irrevocably. From the bus stop at Coniston, carry on up the main street a little way then turn right at the Black Bull and immediately left, following the sign to ‘Coppermines Valley YHA’. This road goes past the Ruskin Museum and gradually loses its tarmac as it climbs and then enters the valley. Look then for Miners Bridge on the left. Go over this, and then take the footpath on the right, which runs parallel to Church Beck and the road for a while, but then gradually curves away from them, climbing as it does so. At the top of this path turn right onto the quarry road, and just keep climbing. Ignore the path that immediately turns off to the right, although if you want to detour along here to go and see the giant Pudding Stone boulder, you can. But the main path goes up Coniston Old Man, and up, unloseable, but steep and stony. 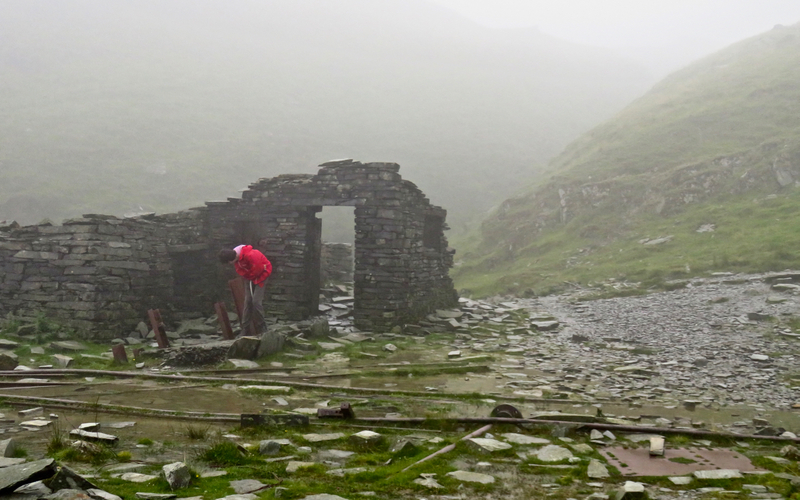 Distraction is provided, first, by the remnants of the slate quarry, complete with rusting ironwork, including the only railway tracks you’re going to find several hundred feet up a Lakeland fell. These are on an impressive scale and the quarry must have been a major operation at its peak. 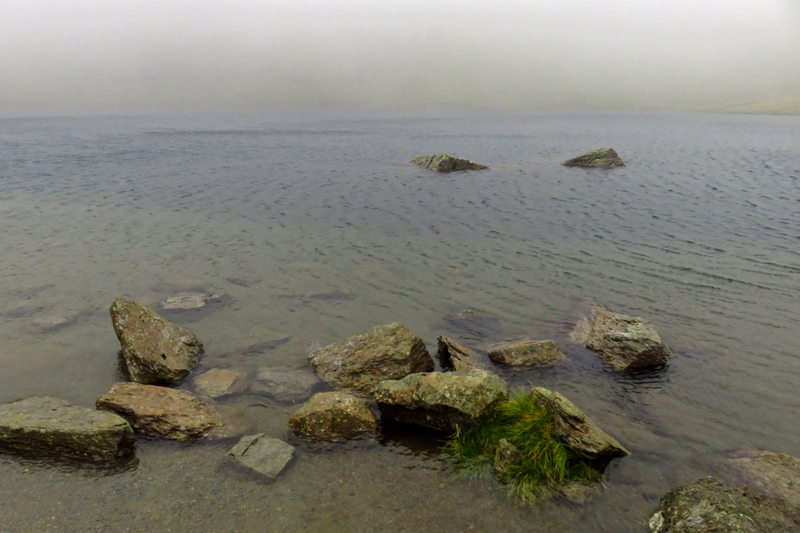 In the mist, this was a very atmospheric spot. The second distraction is Low Water. Wainwright admits that this is a ‘good place for giving up and going to sleep’. On a hot day, he may be right — there are still about six hundred feet to go from this point, and the final climb does outstay its welcome somewhat. But you reach the summit of the Old Man in the end, of course. From here, Brim Fell’s summit is, again as noted in the book, ‘ten minutes’ stroll’ (we timed it). 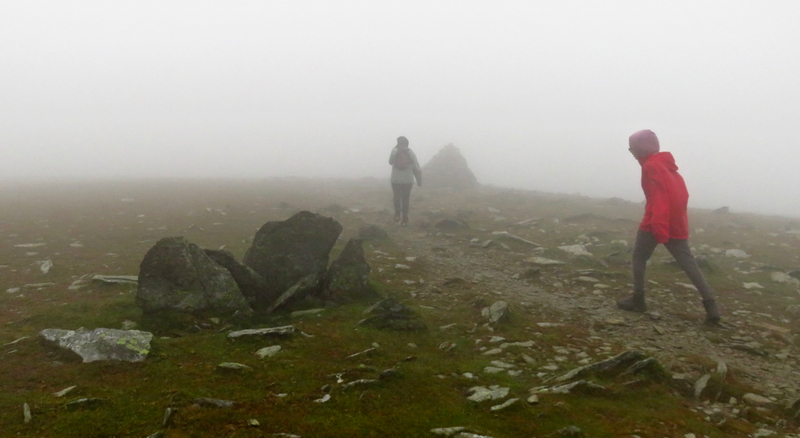 In the mist, it was worth noting the advice that the path down to Goat’s Hause is more prominent than the ridge path, although a cairn is there to indicate the bifurcation: the right-hand path is the one way you want at this point. Cairns were also very useful as we continued along the ridge over Brim Fell, as the path becomes intermittent; in clear weather this path might seem over-cairned but in the mist they were a necessary aid to following it. Note well that there is no need to go uphill at any point after leaving Brim Fell’s summit. Levers Hause can be identified because it is the very last point along the ridge before you need to climb. 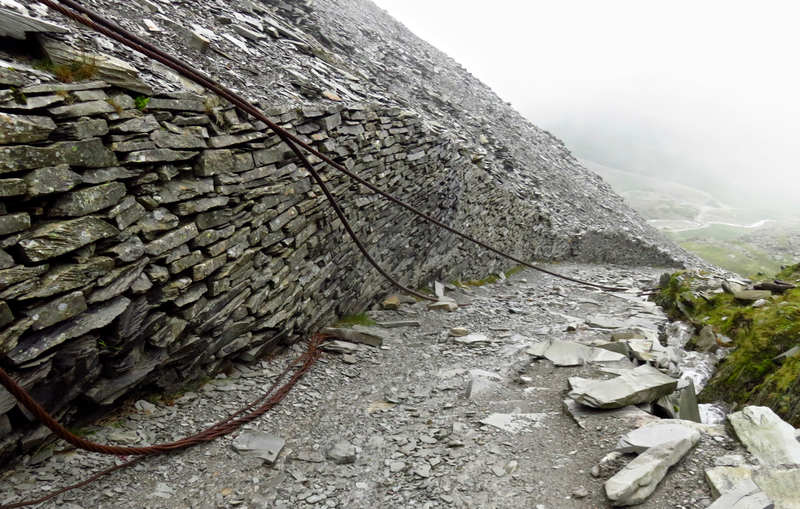 It’s important to get this right, because the path down to Levers Water on the right is not obvious at the Hause. A couple of cairns do show the way though. The descent of the path from Levers Hause is not a particularly pleasant one, it must be said, but just take your time and you’ll get down in the end. Once you reach the corner of Levers Water, the path round to the outlet goes to the right, as shown on the maps in Wainwright. There is a path to the left, along the north shore of the tarn, and as paths go this is no problem to follow; but the difficulty with it comes at the end, where you have to cross Swirl Hause Beck. With the water being high following the morning’s rain, we didn’t find this easy. (The key was to do it right at the mouth, where an island splits the flow in half and makes it safer.) So I would go round the other way, as suggested in the book. A ‘ford’ at the outflow of Levers Water makes crossing there easy. 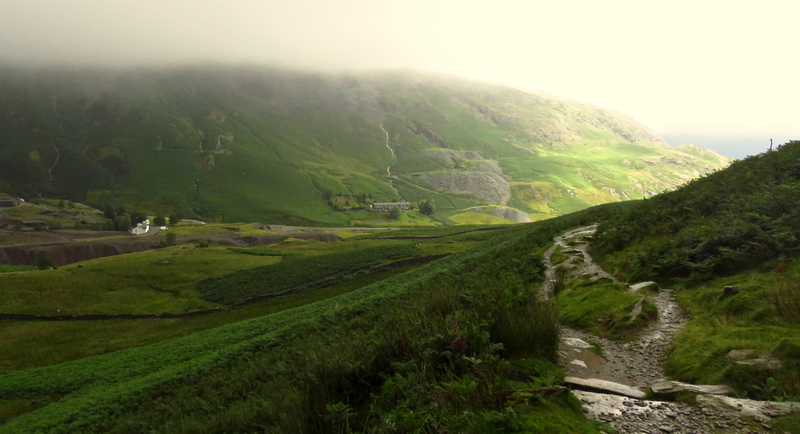 From the outflow, just follow the path back down into Coppermines Valley, past the Youth Hostel and back into Coniston. Family frolics commentary: I do still try to involve the family in my various extra-curricular activities, in different ways, but it’s been a long while since Clare came on a walk. In fact, she missed the whole Outlying Years period entirely, and her last Wainwright with me was Latrigg, the end of my 214, on walk 70 in January 2013. (She does claim since to have bagged Black Fell, on her own, in February 2016.) Joe’s done a few more in that time (16 Wainwrights, to be precise, on 8 separate walks in the last four years) — but none were high-effort fells at all, with the highest being Silver How at a mammoth 1292 feet. 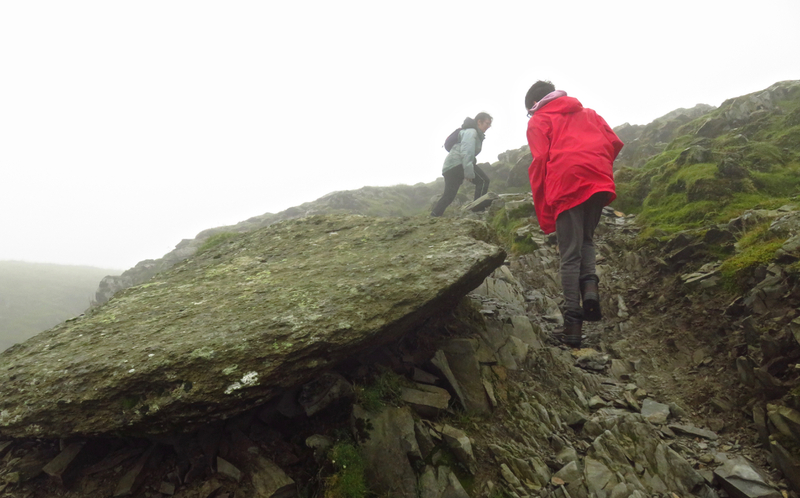 But we had a deal that at some point during this week’s holiday in the Lakes they would both come up at least one proper mountain with me, and it turned out that today was the most practical day to do it. I’d pencilled in Coniston Old Man as the destination a while back, seeing it as a logistically simple target, and one with something of a pay-off, namely a very good view. The plans were nearly scuppered by the weather, however. The morning saw it teeming down with rain, definitely not a day to walk (particularly with two less-than-committed members of a party). But the forecast did say it would get dry after lunch. So we got ourselves into position by taking the bus to Coniston and arriving about 12.30, having lunch in a café then setting out at 1pm, making walk 131, comfortably, the record-holder of the latest start to any of my walks, and the only one I’ve started after lunch. Not that all the clouds then simply blew away, leaving cerulean skies. Despite the occasional promise offered by views of distant lands bathing in the sunlight (hinted at in a couple of pictures on this page), the Coniston range remained firmly cloud-locked all day. Though at least, as I kept reminding my companions on the way round, it wasn’t actually raining. Ah well. Maybe that means it’ll be four more years before the wife joins me again (perhaps for the last walk of all, as I should finish the second round in 2021 at the pace I have set all along); though I have Joe on a promise to do a couple more in October. 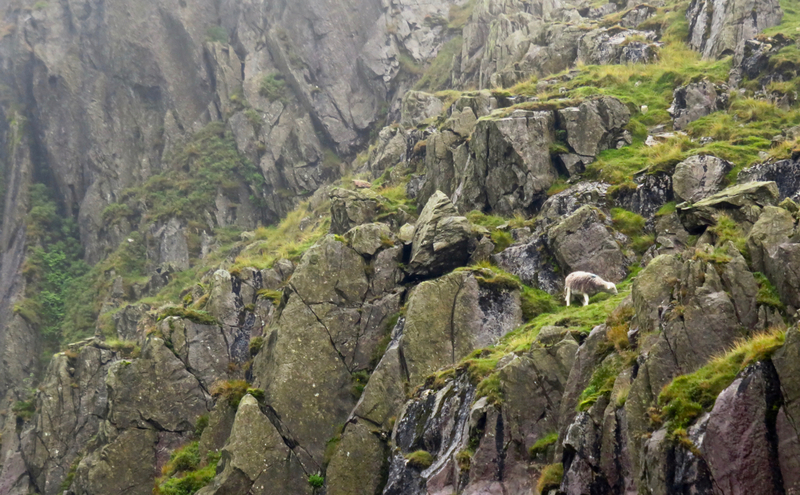 They’ll be comfortably back under 1300 feet though, I have assured him. I type this knowing I won’t be uploading it until at least Friday evening, due to my being unable to connect to the wifi here in Ambleside YHA (which is an issue with my computer rather than their service by the way: actually this is a very good place to stay). So I know that the walk I had originally planned as walk 133, to be done on Friday (tomorrow as I type), may now be changed. I had planned to go along the south side of Ennerdale, i.e. Pillar, Scoat Fell, and neighbours, but don’t fancy doing yet another high-fell climb if clouds will spoil it. Not sure about alternatives yet: but that’s the fun part, pulling out the maps and planning. I’m one fell off being one-third of the way through round 2, but that means there’s still two-thirds of the District out there that I can revisit. So I’m sure I’ll find something.